Bout of Books 9.0 Grand Prize Winner! Bout of Books 9.0 has ended but the fun doesn't stop until the Grand Prize Winner is announced! Jamie's winning entry came from liking The Path of Least Revision on Facebook. 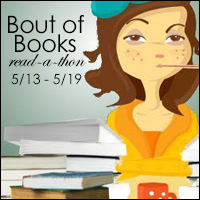 For those that are interested in helping out for the next Bout of Books, we post a call for help roughly a month prior to the start of the read-a-thon - which will be around April 14th for Bout of Books 10. Keep an eye on this blog for that announcement. Once again, thank you to everyone who helped make Bout of Books 9.0 a success! We appreciate that you love books and that you're willing to shout it to the stars! You have survived Bout of Books 9.0! Bout of Books 10 will be from May 12th to 18th. We'll have a #boutofbooks chat between now and May. Watch this space for details.